Inventory management is an important aspect of express delivery systems. In the past, human beings were the main tool used to collect and disperse inventory data. The introduction of the barcode helped make inventory management more accurate, but human beings were still needed to operate the barcode readers. As a result, inventory management was still very time-consuming. WebSCADA can be configured as an instant tracking system for logistics management. Its communication gateway can be used as a front-end controller in an RFID logistics system. 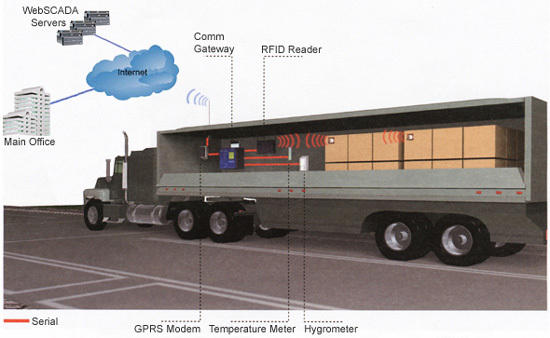 In WebSCADA tracking system, an RFID reader, a communication gateway, and a satellite modem are installed in each delivery truck. The RFID reader and satellite modem are both connected to the gateway, and an RFID tag is attached to each package. This type of system can be used to send real-time information of the location of each package back to the main office. WebSCADA RFID logistics system is very powerful, and it can be applied to many industries for inventory management.